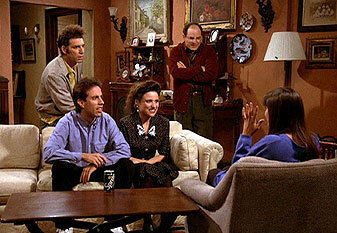 "The Nose Job" was the twenty-sixth episode of Seinfeld. The episode was the ninth episode for the show's third season. It aired on November 20, 1991. The episode was written by Peter Mehlman and was directed by Tom Cherones. George thinks his girlfriend is perfect, except for one flaw: she has a large nose, so Kramer encourages her to get a nose job. Meanwhile, Jerry is conflicted about his relationship with an actress, played by Tawny Kitaen, whom he finds beautiful but with whom he has nothing in common. Also, Kramer needs Elaine's help in reacquiring a jacket that supposedly has an attractive power over women.